It's already in full swing. Thanksgiving turkey mania. You know what I'm talking about. The endless, frenzied debate over how to cook the perfect turkey. With all the food magazines, cooking shows and turkey hotlines available, I know you'll find more information than you ever wanted on the bird. That's why I'm posting about Thanksgiving side dishes: They're much less controversial. You can't brine sweet potatoes or deep fry cranberry sauce. At least, I don't think you can. Last year I shared four Thanksgiving side dishes with a twist: Perennial favorites like sweet potatoes and string beans got a makeover. They looked fabulous. But we can't make the same veggies this year. Well, except for the String Beans with Prosciutto, Pine Nuts, and Lemon. I have to make those again. Don't worry though. I've got a few new ones for you that won't disappoint. Let's start with Festive Stuffed Acorn Squash. 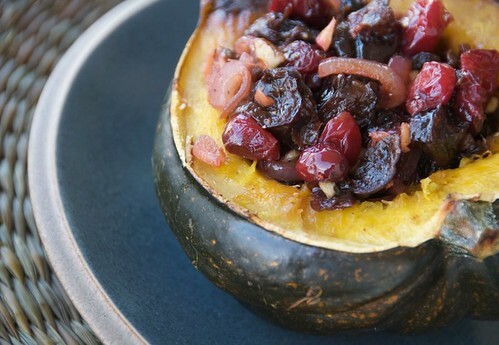 A robustly sweet and tangy filling of shallots, cranberries, prunes and pecans is nestled inside of a hot roasted acorn squash half. If you've just wrinkled your nose at the word "prunes," trust me, they're the ideal foil to tart cranberries. But if you just can't abide the thought of them, swap them for sweet Medjool dates. Everyone loves Medjool dates. 1. Preheat oven to 375 degrees F. Line a large baking sheet with aluminum foil for easy clean-up. Slice acorn squash in half and remove seeds. Brush flesh with a bit of olive oil and place flesh side down on prepared baking sheet. Cook 35-45 minutes, or until tender when pierced with a fork. 2. In a medium skillet, melt butter. Add shallots and saute 3-5 minutes, until soft. Add cranberries, prunes, wine, water, salt and black pepper. Cook until cranberries pop and the sauce slightly thickens, about 5 minutes. Remove from heat. Taste. Season with additional salt and pepper, if desired. 3. Divide filling equally among the four squash halves. Sprinkle with chopped pecans and serve hot. Maple Roasted Acorn Squash and Cornbread Stuffing recipe at Karina's (gluten-free) Kitchen. I love stuffed acorn squash - but what I really love is the thought to add dates! That sounds delicious. Thanksgiving is long done here in Canada but the holiday season is definitely coming up. Bookmarking! The color combination is irresistible, and this dish just screams New England. This looks so pretty! I love trying new side dishes. Thats the best part of Thanksgivng to me. Well, the desserts too. These colors are just beautiful! I love cranberries. I'll be honest, I much prefer sides to turkey anyway. In fact. I plan on not eating any turkey at all. This stuffed acorn squash is all I'll need. Also, I'm reviewing a copy of your cookbook (Recipes Every Man...) any recipes I absolutely NEED to try? Definitely bookmarking this. I'm looking for new sides for Thanksgiving and this sounds delicious! Looks so yummy. Do you believe I have never eaten acorn-squash. It's one of the few kinds I haven't tried. I need to expand my squash horizons! Acorn Squash is simply the perfect vegetable to stuff! val-It's lovely for X-MAS too. lydia-Great! It did remind me of home. lynda-I'm with you. Veggies and desserts. teachercooks-I'm so glad you like it! This is so fantastic! Thank you for the side dishes. Between your innovative sides and Alton's "Apps" we're going to break out of our Thanksgiving rut. Is it bad that my first thought when I saw this picture was, "Hey, my one-year-old son might eat that!"? Really, I think this is a great looking dish and will probably make it for my kid. And if he doesn't want it, more for me!